You may already be familiar with Rich haircare from my previous post about the shampoo and conditioner. When I was sent them, I also received this Leave in Conditioner, and I was probably the most excited about that than anything else. As I picked it up this morning before I dried my hair it dawned on me just how much of a staple it's become in my (admittedly very limited) haircare routine. I'm growing my hair long and it's had balyage and highlights on a few occassions so I have to take care of the ends. I've passed the 3-month mark since my last haircut and my hair is only just beginning to show signs of wear. I put a lot of this down to the extra conditioning action I'm getting from my leave in conditioner. It's a light mist, as opposed to a cream, and you brush it through damp hair. It has UV and heat protecting elements - can't get too much of that, can we, it doesn't feel heavy or greasy and has nice things that nourish and strengthen hair. 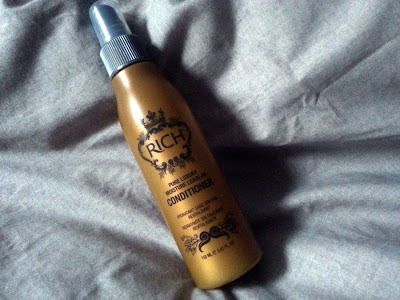 Rich haircare is available in pharmacies - have you picked up any?